Welcome to all of you. We are writing to you from a prison in Michigan, USA. Kit Cummings calls us the “Mighty Men of Muskegon.” Yes, we are tattooed on Kit’s arm, but it is Kit’s 40 Days of Peace Program that has left a permanent mark upon our lives. 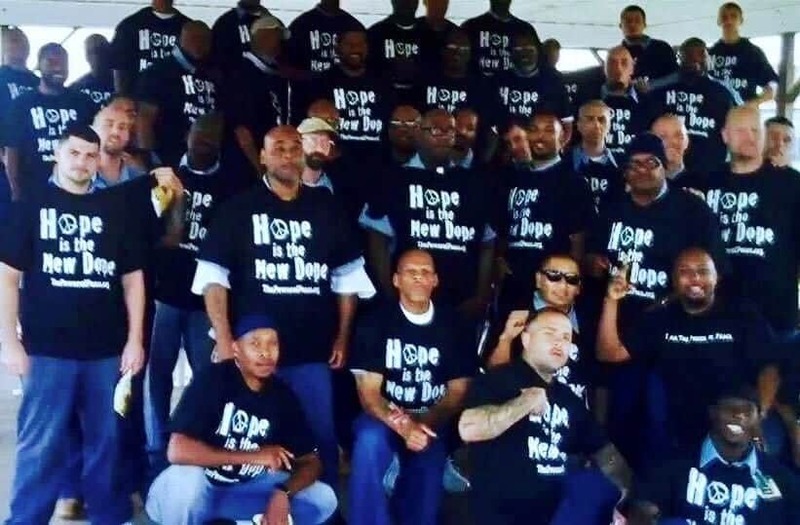 Kit Cummings has been coming to our prisons for 4 years spreading his message of peace, freedom and prayer to hundreds of inmates. Through Kit’s help we have replaced violence with peace, hate with compassion and retaliation with communication. We seek to understand and listen to our adversaries before we judge and disrespect them. We learn that peace is an inside job and that Hope is the New Dope! Before Kit came, many inmates felt lost in the chaos of our prison’s violence. In prison, we are taught to maintain respect through violence, to trust no one and to live only for ourselves. Kit showed us through the lives of the world’s greatest peacemakers that many of their greatest achievements began with a single action of peace. One example was Cesar Chavez who achieved great social and work reform for US Latino workers through aggressive yet peaceful measures. Now, when we walk in the yard, we see our fellow brothers of the Peace Project wearing the wristbands and we talk. We have found a new brotherhood of men who want to get more out of life. We want better marriages. We want to be great fathers. We want to experience hope and freedom. We want to live with peace in our hearts and lives. Things are changing here in Michigan. With Kit’s leadership, they can change for you, too.